The October morning air was crisp, and the rows of potted trees and plants were waiting for their forever homes in the ground. It didn’t always look like this. Imagine invasive weeds encroaching on open space and you’ll quickly see the opportunity to restore an urban forest in its place. Ready to dig, nearly 200 volunteers joined the Mountains to Sound Greenway Trust and the City of Mercer Island for the Annual Tree Planting Celebration at Luther Burbank Park. In a half-days’ time, volunteers planted 1,144 native trees and shrubs to improve and enhance urban forest habitat. This year’s event inspired memorable celebration in both the significance of the urban location of the event and the 10-year partnership milestone with Carter Subaru in support of the Greenway Trust. 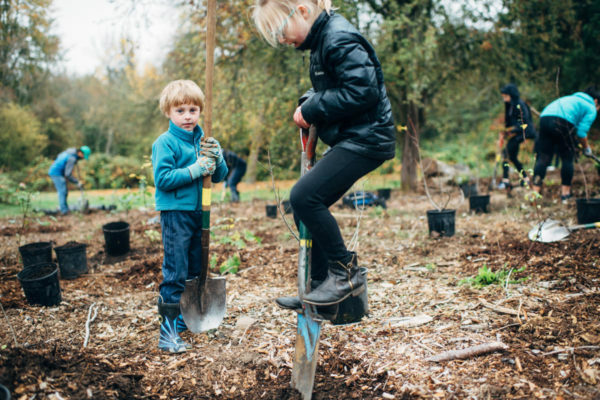 Kicking-off the tree planting season in the Greenway, the City of Mercer Island was recognized as a designated Tree City USA and celebrated their first Arbor Day on the momentous occasion. On behalf of the community, Mercer Island Mayor, Debbie Bertlin and City Manager Julie Underwood received the award presented by Lisa Ciecko, Plant Ecologist with the City of Seattle and Vice Chair of the WA Community Forestry Council. King County Councilmember Claudia Balducci also joined the celebration to thank the volunteers for planting trees that also count towards the County’s initiative to plant 1 Million Trees by the year 2020. The program is part of the County’s Strategic Climate Action Plan to reduce carbon pollution and prepare for climate impacts. Mercer Island has now joined the ranks of 3,400 communities across America that have made the commitment to becoming a Tree City USA. This is achieved by meeting four core standards of sound urban forestry management: maintaining a tree board or department, having a community tree ordinance, spending at least $2 per capita on urban forestry, and celebrating Arbor Day. Open spaces and parks are cherished in the City of Mercer Island, a place that fosters community within a beautiful natural environment. Luther Burbank Park is a shining example of this relationship and how it takes an invested community to make certain this intrinsic connection thrives. The long-term commitment form the City of Mercer Island is evident in the successes that have been achieved in more than 15 years of collaboration with the Greenway Trust. Celebrating a partnership milestone, another valued partner has shown incredible commitment to the Greenway Trust’s mission of ensuring this kind of long-term balance between people and nature. 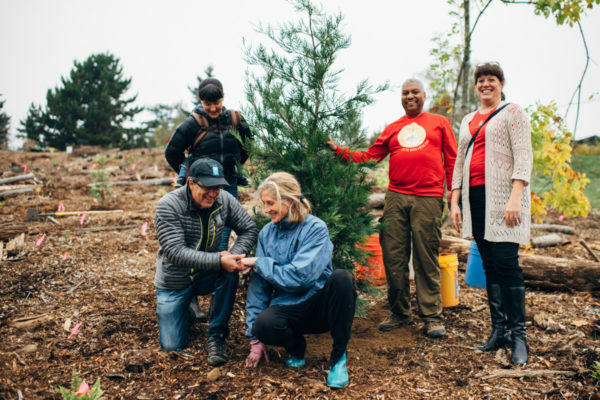 Since 2008, Carter Subaru and Volkswagen have planted more than 185,000 native trees in the Greenway, of which Mercer Island is a part. 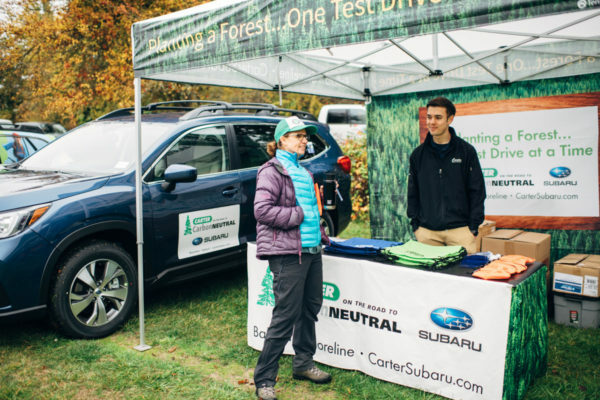 Through this commitment to reduce their carbon footprint, Carter Subaru is setting a national example of conservation business ethics through its home-grown “On the Road to Carbon Neutral” tree-planting program. When Carter Subaru plants one tree for every test drive and an additional three trees for every car sold at their Ballard and Shoreline locations, the trees add up fast. During a lifespan of about 75 years, those four trees will absorb the approximate amount of carbon dioxide emitted by the average car driven in one year. Adding up fast were also the number of volunteer service hours, 798.5 in total, given to this restoration project by the combined efforts of friends, families and work groups , including players from the Seattle Rein and Seattle Storm. An annual tradition for the corporate volunteer group, AAA Washington, the energized crew brought more than 40 volunteers to help pitch in. 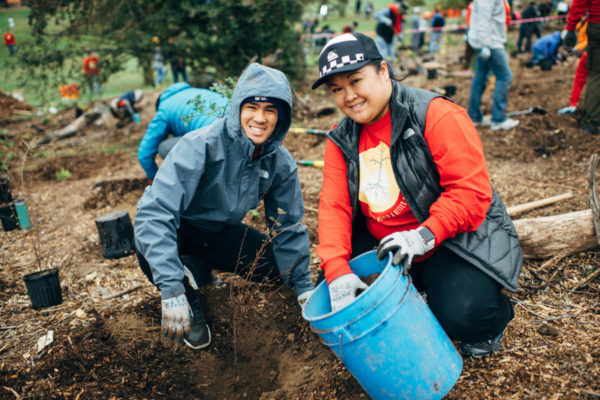 In all, the Tree Planting Celebration is a favored event by new and returning volunteers as bright smiles persisted from the first turn of the shovel up until the last tree was nestled in the ground. 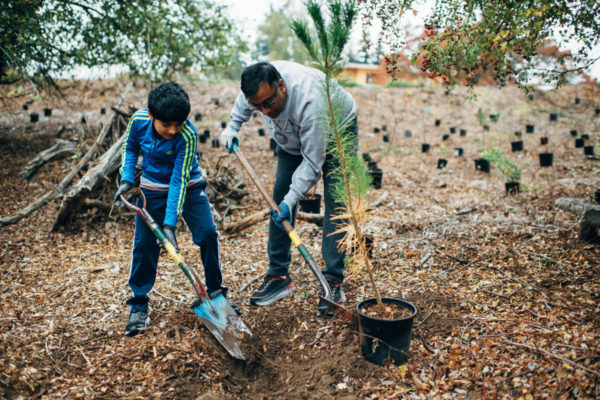 Want to help plant more trees? The Celebration is the first of many tree planting events this fall. Check out our list of upcoming events. Tree planting events are excellent for individuals, families, groups, and work teams. The Greenway Trust provides all the tools, plant material, gloves, and project oversight – no experience necessary.